Red Carnelian in Grade AAA Oval Cab Gems This Natural Reddish Orange Carnelian Gemstone in the AAA Grade, Displays an even Intense Orangy Red Color, With a Good Cut, Good Polish and Medium Dome Shape. 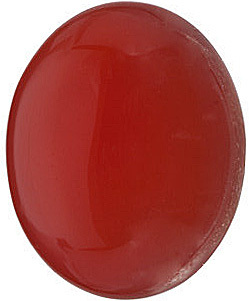 This Carnelian Gemstone Has Been Enhanced to Improve the Consistency of Color. Smooth, soothing to the touch, beautiful carnelian. What a beautiful red, orange red or reddish brown gemstone. It is a member of the chalcedony (quartz) family which also includes onyx and jasper. 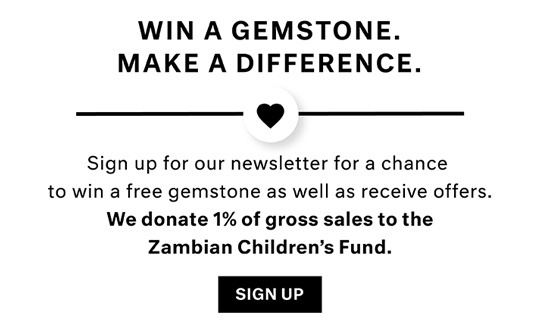 AfricaGems.com carries beautiful blue and purple chalcedony in addition to carnelian. Carnelian has been around as a gemstone forever. It was used in rings and signets by the Greeks and Romans. It has been carved into intaglios and cameos for centuries. Hot wax does not stick to carnelian so it was well suited to use in signet rings. Drilled carnelian from the 4th � 5th millennium BCE has been discovered. It seems that in ancient times, it was exclusively the property of the then rich and powerful in society, i.e. the noble class. Some in the noble class were even buried with this gemstone. 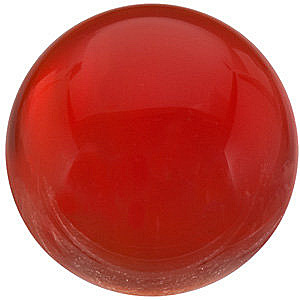 Carnelian is a translucent gemstone. It has a hardness of 7 on the Mohs scale. It often is used as a birthstone for the month of July as well as the Zodiac birthstone for Virgo. It supposedly is an energy booster to the wearer and will help an insecure person find strength. It is also supposed to protect the wearer from bad vibrations and negative energy, calm a temper, guard against poverty and helps give one a sense of humor. Carnelian is a natural gemstone that is usually heat treated to bring out the best color. Carnelian is a �delicious� gemstone when set in jewelry. It works with as an accent stone with many other gemstones or all by itself in a simple setting. And best of all, it is very affordable.